I'm totally thrilled! Burning 10 hours of CPU time and what is the result? 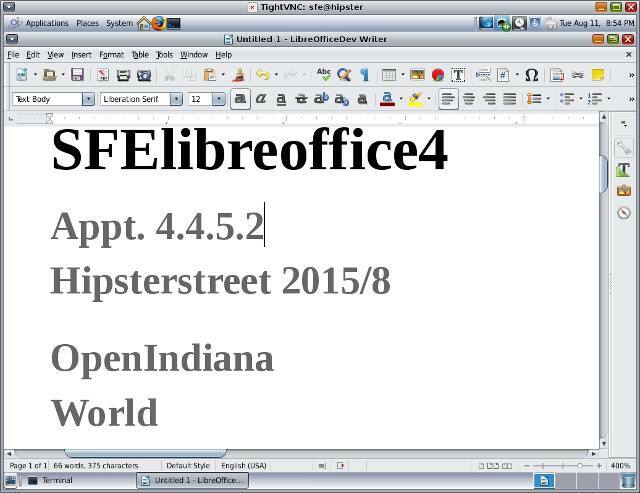 We have LibreOffice 4.4.5.2 now in SFE! The spec file to build it is for a moment still in the experimental area, but the first build will hit the OpenIndiana Hipster IPS repository in a few hours. Credits! It's all about Credits! 1. The LibreOffice Team and all the supporting Team giving libraries and more. 2. As far as I know it is Mr. Tribblix, he did a maaajor part of the porting to solarish OS for his own OS Distro. And very important (!) he wrote on his blog about all the details! 3. Pjama, hey, the verrrry best greetings to australia, thank you so much for your quality spec files and your trust to hand them over for integration! It was only cosmetic stuff to align with SFE. and burn CPU time. It took 10.5 hours to compile the final shot. Wha does SFE spec-files-extra survive so many years? I believe its because of fantastic maintainers, a superios set of OS-Distribution where is runs on. Oh, by the way, SFElibreoffice4 is today on OI Hipster 2015, but will be worked on to be available on OI151a9, Solaris 11 and if you have access to is Solaris 13 devel. That is why SFE can be successfull, I believe because so many OSDistro share maintenance work for the wonderful packages which make your OS a success and fun. Looks like repository has consistency problems. Thanks for bringing this to my attention. I've searched for the source of the problem, the sync-script had no error, but my info-file configuring the repos that needed to be synced had an old "release" string for the previous OI Hipster version. That successfully prevented syncing the files (saving bandwidth+diskspace), as the now current SFE repo for was not included in shared files area. (Background note: all the IPS repos in sfe.opencsw.org share the /file/ area, because so many files are bit-wise identical across the various distributions S11, S12, OmniOS, OI 151a8 / Hipster). It will take a moment to get the sync completed, if you want, you can watch the IRC channel on irc.freenode.org channel #sfeautobuild which prints the steps during the repository uploads. There is a finish mark which reads "end reposync". If you like, drop me a note if the install of this first shot of LibeOffice was succesfull after the finished repo sync to http://sfe.opencsw.org/localhostoih. A note about LibreOffice: Calling the script "soffice" does not really bring up a usefull screen, but if you call e.g. "soffice -writer" that should give you the text module. But, I have spotted that Tools -> Options -> LibreOfficeDev -> Advanced has lack of JRE settings (dimmed, cannot change). Explanation: tried to install extension LanguageTool-3.0.oxt and it has failed with error ImplementationRegistration::registerImplementation() - The service com.sun.star.loader.Java2 cannot be instantiated (searched around, and couldn't find solution). is this a typo in the JAVA_HOME? "jdak" might be correct as "jdk"? The Java version should be a 32-bit one, as LibreOffice could have binary objects in 32-bit. On the build machine I believe I have the OI-hipster own jdk 1.7 installed. I'll check the exact package and version and update this comment. when you call "soffice" (which is empty/not existent). add the missing package dependencies to the LibreOffice package. and still see no JRE in LO (maybe to put 32bit info to OI wiki page somewhere?). Hello, that's really great news! I am a pleased Solaris-User (as it did never abandon me and works fast and reliable) and I thank the community for their great work! Although I use a really good and professional system, my knowledge of compiling on Solaris is quite limited so it is great we have sfe. Thanks to all!